In the past few weeks, the Trump Administration announced they will begin separa ting all children from their families at the border, the Department of Health and Human Services (HHS) disclosed that it lost track of over 1,000 children that made the journey alone to the U.S. and the American Civil Liberties Union reported cases of abuse of children by U.S. Customs and Border Protection (CBP) during the Obama Administration. The criminalization of children and families seeking protection in the U.S. is, unfortunately, nothing new. To respond to this crisis, the ELCA passed the AMMPARO Strategy in 2016 to accompany these vulnerable populations in their countries of origin, in transit and in the U.S. As this Administration continues to harshly target people who are seeking safety, here are four things you need to know and two ways to get involved. Central American children and families arriving in the U.S. are fleeing violence, impunity, lack of opportunities, environmental degradation and poverty. While policy makers and news organizations often refer to this population as undocumented, many children and families are lawfully seeking protection through our asylum system – a system formalized after World War II allowing people to seek protection in another country. Asylum applications from the northern part of Central America increased 58% globally from 2016 to 2017 as a result of political violence and oppression and continued high rates of murders, violence against young people and extortion. While ripping children from the arms of their parents at the border is being used as a “deterrence” mechanism for people to stop coming to the U.S., the Administration’s policy is hurting children who have already escaped terrible situations and are seeking safe heaven. Under current law, children from most countries who arrive in the U.S. alone or are separated from their parents are screened by an expert to ensure that they are not victims of trafficking or other crimes. This critical step to protect children from trafficking and abuse passed in 2008 with bipartisan support in the Trafficking Victims Protection Reauthorization Act (TVPRA). Many legislators today refer to provisions in this act as “loopholes” and are actively trying to strip protections for these children in order to detain and deport them as soon as possible. For example, the Securing America’s Future Act(H.R. 4760) and the Border Security and Immigration Reform Act in the House of Representatives would make it easier to deport children without proper screening for child trafficking or abuse if passed. 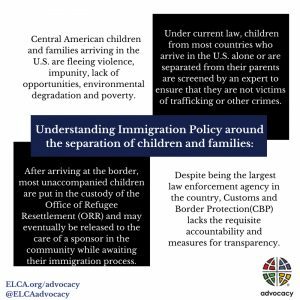 ELCA Advocacy has repeatedly stood against efforts to take away such protections for these children. 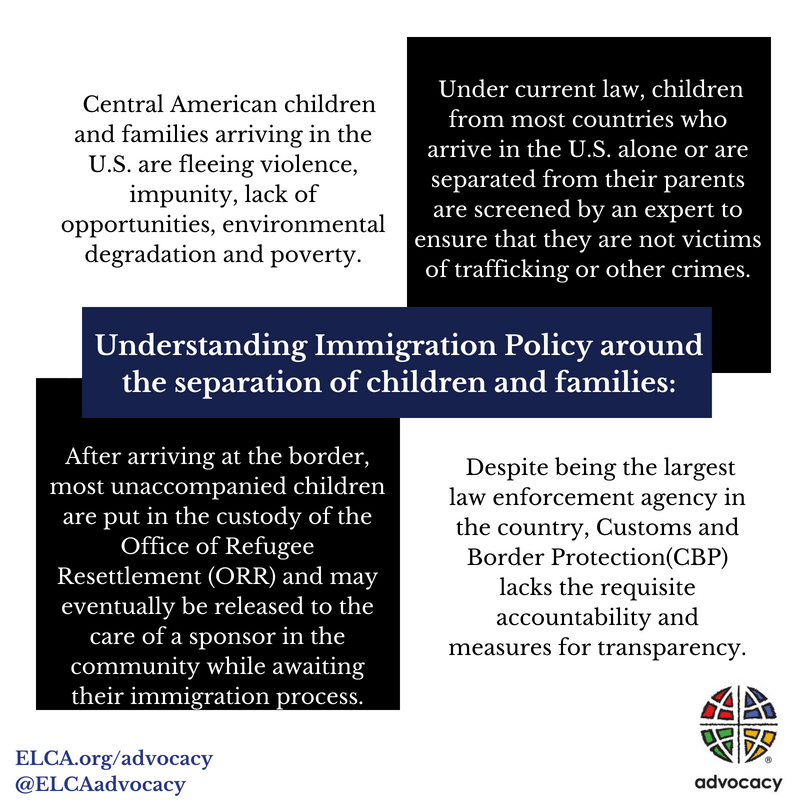 After arriving at the border,most unaccompanied children are put in the custody of the Office of Refugee Resettlement (ORR) and may eventually be released to the care of a sponsor in the community while awaiting their immigration process. On April 26, 2018 an ORR official testified that between October and December 2017 the U.S. Government had reached out to 7,600 sponsors and could not determine the location of 1,475 children during the period in which the calls were made. These children were not lost in U.S. Government custody but rather ORR was unable to reach them by phone when the calls were placed. Unlike the Department of Homeland Security, ORR has the child welfare expertise to properly evaluate children. ORR must be provided the resources needed to follow up with all cases. Despite being the largest law enforcement agency in the country, Customs and Border Protection (CBP) lacks the requisite accountability and measures for transparency. In Fiscal Year 2018, Congress allocated $16.357 billion to CBP, a 15 percent increase from the previous year. CBP’s consistent increase in federal funding, however, does not come with a corresponding increase in oversight when the agency engages in abuse or excessive use of force. As the ACLU report on the abuse of children in CBP custody and the killing of Claudia Patricia Gomez Gonzales, who was shot and killed by a CBP officer, highlight, accountability and transparency are key in ensuring the safety and humane treatment, not only of migrants but of border communities. Congress and the Administration must provide for oversight of CBP to ensure accountability and transparency. As policies continue to target vulnerable children and families, people of faith of have been leading the charge in providing services and advocating alongside these communities. Here are two ways in which you can help children and families facing these policies. Join a Network that accompanies these children and families. The ELCA has the AMMPARO strategy in which congregations can form part of a welcoming congregations network around the country. These congregations commit to accompany children in their community, pray and advocate for migrant children and families. Lutherans can also learn more about these issues from Lutheran Immigration and Refugee Service. Advocate. Advocate. Advocate. Whether in the budget process or through stand-alone bills, Congress can provide much-needed oversight and regulation to policies that are hurting children and families. They must hear your voice. Join our Action Network and check our Facebook page and twitter to stay current on these policies. « Previous Post: Paris Rulebook: We Have to Get It Right!